When my mate Islay was here from New Zealand for Cicily's funeral she mentioned this tradition over there of an unveiling for a new headstone. The Maori tradition is that a year or so after a person dies, after the most deepest grieving is through, they have a gathering to reveal the person's memorial. The more Chris and I thought about this tradition, the more we loved it and decided to do it for Cicily. Except we put our tradition spin on it of getting a grave marker as soon as possible. 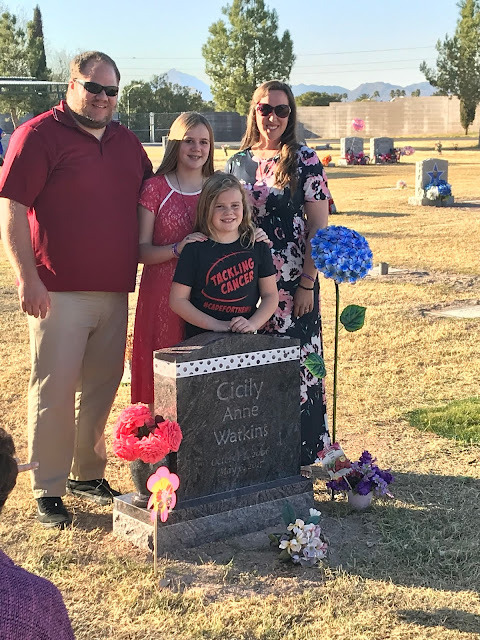 Cicily's monument was installed this weekend and today we had the unveiling. We weren't really sure what one does at an unveiling, but my friend Mandy suggested polka dot heart sugar cookies which sounded perfect! Here's some of the unveiling attendees. The monument in a drape. Sophie wanted to be the one to actually do the reveal. Except she kinda loves keeping people in suspense and gets a little weird being at the center of attention. So in the end she needed help from Maya who jumped in and claimed she was "the Force". Together they removed the drape for the big reveal! I'm sure Cicily was cracking up at both of her sisters in classic form. 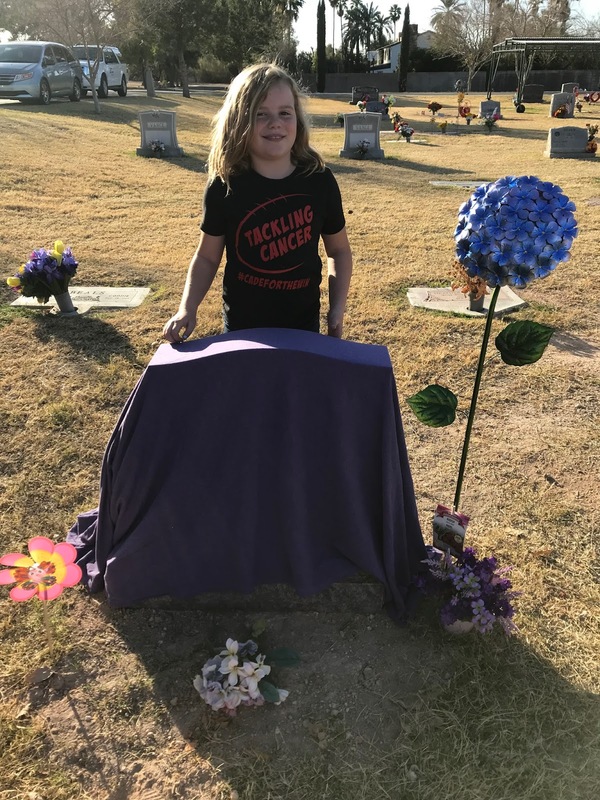 When Chris dedicated Cicily's grave, he said it would be a place of happiness and even laughter. And it really is! I cry and get sad tons of other times because I miss Cicily, but at the cemetery I almost always end up thinking of happy memories and feeling proud to be this girl's Mom. This is the back. John 9:3 is Cicily's special scripture. It's Jesus talking about the man who was born blind. We believe that Cicily's mission on the earth was to make manifest the works of God and spread the light of Christ in the world. 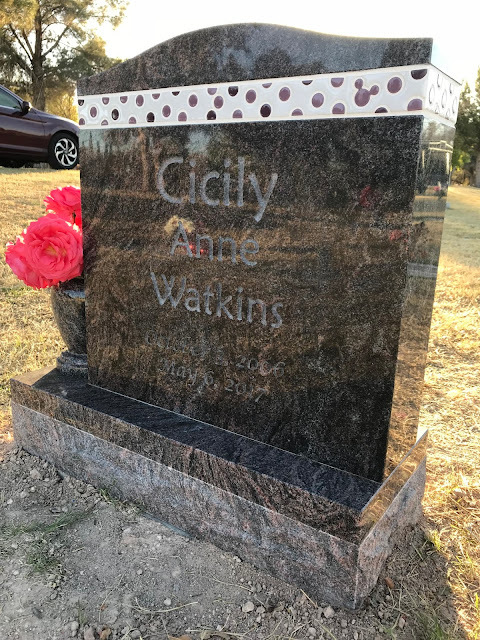 We wanted our family's names on the headstone so everyone would know who Cicily belonged to, but Maya thought it was a bit weird to have her name on a headstone. I also really wished I could somehow acknowledge everyone who Cicily belongs to and who loves her. So late one night, I had some inspiration and came up with the bottom portion. "Many more" includes all of you who love Cicily and are more kind and loving because you know her. 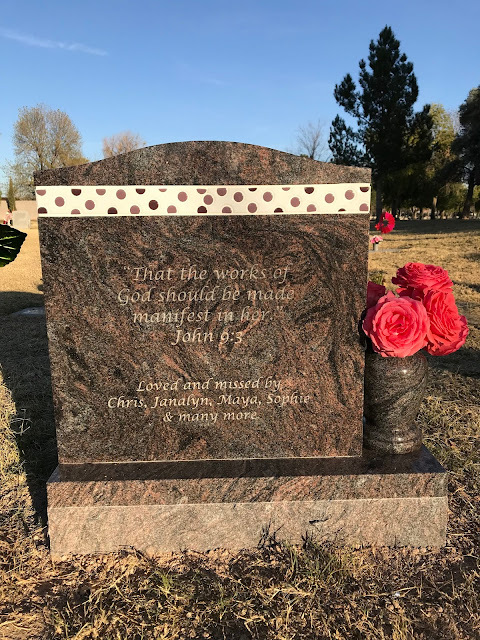 And I have been so touched at all the people who have independently said thanks for including me on Cicily's headstone. The roses are from our rose bush in the front of our house. It feels so nice to grow something beautiful that I can leave at Cicily's spot. We think the memorial turned out absolutely perfect! We really wanted it to represent Cicily: classic, beautiful, poignant, playful, and even silly. Notice the hidden mickey mouse? We like to think it's a joke Cis would crack up at! The granite is almost a purple, Cicily's favorite color of course. And POLKA DOTS!!! We would like to give a salute to Pavel at Western Monument https://www.westernmonument.com/ for creating this beatiful memorial. (And yes, he does create monuments for people out of state.) Pavel is an artist and this is one way he has chosen to use his talents. We talked with him a little about Cicily and together we came up with this beauty to remember her. We thank you for making a work of art for Cicily's lasting memorial Pavel! USES ADOBE FLASH. FOR BEST VIEWING, USE A PC. WAIT UNTIL BOOK LOADS AND THEN CLICK ON THE FULL SCREEN OPTION IN THE UPPER RIGHT CORNER. Shutterfly gave us the most amazing gift when Cicily was on hospice. They allowed us to make wonderful framed pictures, pillows, plates, canvas and jewelry with pictures of Cicily to fill our house with memories of our smiling girl. They also gave us free photo books to share with her cousins. So I made this book about Cicily for them to order. I imagine it being read to her young cousins who weren't quite old enough to remember her in life or families reading together to reminisce. And someday I'd like to read it to Cicily's future nieces and nephews so they can know all about their amazing aunt. I know there are many more people who love her than just her family, so I wanted to share on here as well. Forgive me if you are a special part of her life and are not included in the book as my focus was family for this project. Thank you so much Shutterfly for your legacy gift to us. We will certainly be life-long customers and supporters of your great, compassionate company! I wanted to put a shout out there to all the amazing people who have done something for our family while Cicily was sick and after she died. We have been the humble recipients of dinners, foot massages, homemade pillows, flowers, paintings, sculptures, and more. Each and every gift and gesture of love and compassion has meant so much to us and truly lifted our heavy hearts. Thank you, thank you to all who have blessed our lives these past months. We have most especially appreciated every one of you who has participated in the power of prayer on our behalf. We cannot deny the immense power and comfort that your prayers have blessed us with. There is no earthly reason that accounts for being filled with grief at not being able to make Cicily smile; but still being able to find joy in life. I know the joy we've found is possible because of so many prayers and the Holy Ghost comforting our hearts. And so many friends mourning with us and sending us love and positive thoughts. It has been truly amazing to feel of the very real power of comfort from prayer and love. Thank you to you who have prayed for us. Thank you to you who have shared gifts with us. Thank you to you who have fed us. Thank you to you who have cried with us. Thank you to you who have asked us about Cicily. Thank you to you who have listened to us talk. Thank you to you who have shared Cicily stories with us. Your acts of love have carried us. 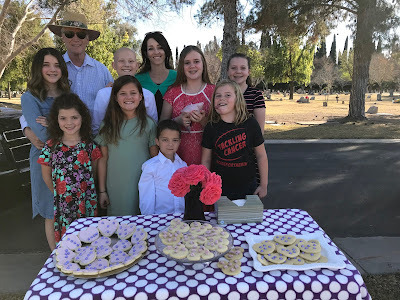 Why we say "died" instead of "passed away"
We may sound a bit harsh or nonchalant when we talk about Cicily dying in our family. There are reasons for this I'd like to explain. 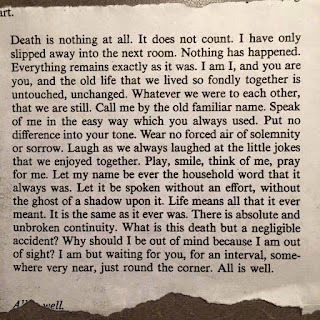 A couple weeks after Cis died I was talking to Sophie and happened to say in the conversation "the night Cicily passed away". Sophie looked at me with her perturbed/serious look and said, "you can just say died Mom. Cicily's not past. She just died is all." I had to agree with Sophie's logic. Cicily dying is something we've known would happen and something we've always been very open about in our family. To Sophie dying is just another part of life. A new chapter. It's doesn't mean someone is "past" or "away" so to speak, it just means they're in another life where unfortunately we don't get to hang out. So while it may not sound as polite or graceful to say "died", in our family that's what we say. A friend of ours left this on my FB wall. I thought it perfectly captures our family's feelings. 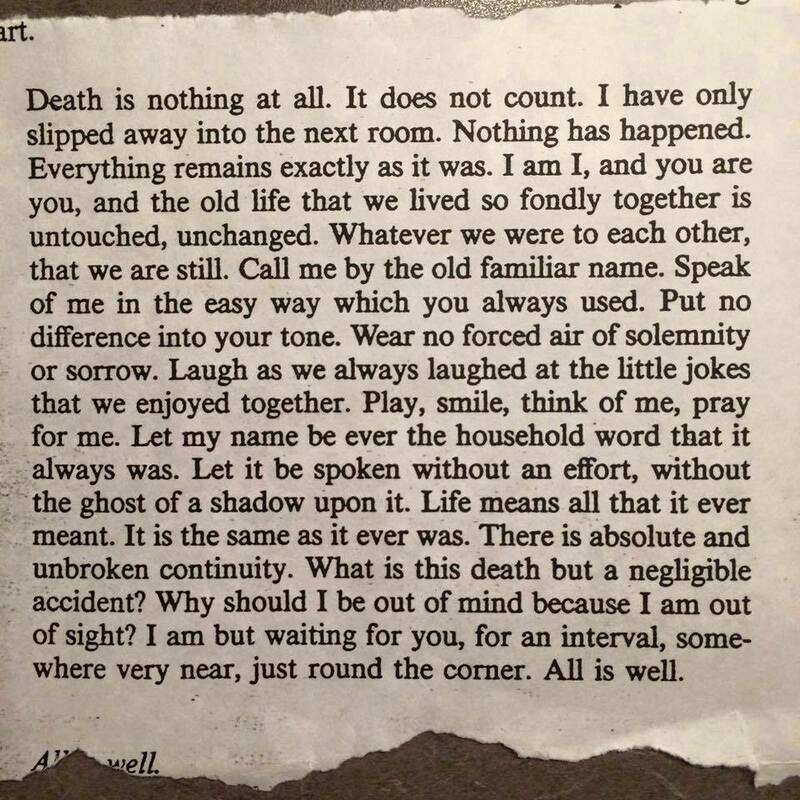 It's by Henry Scott Holland . We love talking about Cicily and love it when friends talk with us about her. Especially when it's easy, with "no forced air of solemnity or sorrow". It was a difficult task when she had recently died. We had to have a family discussion about the more we talk about Cicily in every day conversation, the more normal it will feel. So while we all miss her a ridiculous amount, and I in particular cry daily about it, we still like to talk about her and think about her as we always have. We got the recording of Cicily's funeral yesterday. It's just over an hour long. An hour very well spent! It's perfectly Cicily - upbeat, happy and inspiring. I know you're doubting because it's a funeral. But it was important for us to honor Cicily in the way that she lived with laughter and love. Enjoy! Cicily's farewell was absolutely beautiful today. It was perfectly Cicily. Thank you to all who came and helped make it perfect. 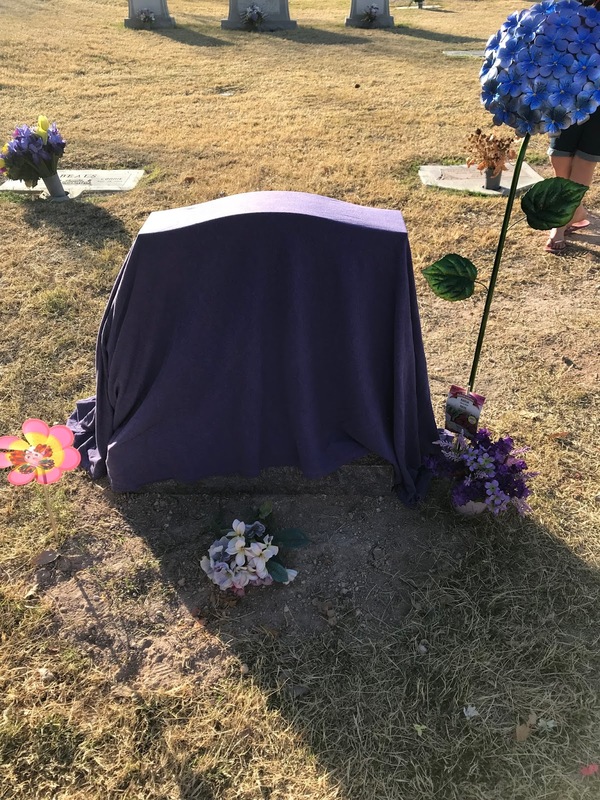 Drove past her body's resting place and took some pictures. Check out that beautiful ray of sunshine. Cicily is still spreading her light. When Cicily was born she stayed in the NICU at the hospital for a few weeks. While she was there I greatly disliked having a nurse tell me how best to comfort her (I've since silently thanked said nurse as her tip was helpful for Cicily's whole life) and I refused to wear gloves to hold her. Cicily was MY baby and I was her Mom. While I greatly appreciated the medical care she was getting, I did not appreciate that she needed care from anyone besides me. While I was sitting by her bedside one day I had the distinct, undeniable feeling of the words, "she's not just yours". Feeling these words did not make me recoil with deep annoyance like they should have, they came with a peace and understanding. Heavenly Father was letting me know from the very beginning that Cicily was on this earth to be shared with others. I was not the only woman in her life that would care for her, love her and learn from her. So tonight I would like to acknowledge, pay tribute and show appreciation for all the people in Cicily's life who she came to be here with. Our family has great love for all the nurses who cared for Cicily in our home. We especially appreciate her besties (the long-termers) Kelly, Michelle, Ashli and Joy. You all enriched Cicily's life in unique ways. It was by divine design that each of you came into Cicily's life. Tamara has been Cicily's school nurse for the past 8 years. She started school with Cicily in preschool and continued to care for her, teach her, love her, and advocate for her the next 8 years. We consider Tamara to be a 3rd grandma to Cicily. And she has promised not to stop calling me as she has done every day Cicily went to school to give me a recap so I knew what to talk to Cicily about. We love Cicily's teachers beginning when Cicily was a baby and JuLee (and her family) came into our lives to teach us sign language. Then Cis went to preschool and had a wonderful teacher and aides. Then Kindergarten and 1st grade where she had a master teacher who could whip out accomodations like most of us blink. 3rd grade where Cicily had a teacher so impressed with how well Cicily learned and worked hard to add on to her knowledge. Then 4th grade where Cicily had not only an amazingly loving and inclusive teacher, but a whole school family. A school family where kids from other classes said hi to her in the halls instead of staring, where she had a gaggle of girls hanging out with her and talking with her at recess, where she had friends who loved her because they understood and appreciated her. Where she had a sped teacher who loved her and helped her play pranks and a principal who gave her a hard time about socks and cruised her around campus in a swing. We thank the therapists who worked with Cicily and helped keep her strong and active. Cicily loves so many of you for making hard work fun. We respect and honor the doctors, assistants, staff, social workers, nurses, and hospital workers whose expertise and caring truly gave Cicily the best chances for a great life. I really will miss waiting in your rooms and throwing around medical jargon with you. We love our church congregation family who have learned with Cicily and been taught by her smile. And who have allowed us to serve and and to be served and cared for. We will forever adore you for giving us the gift of time with Cicily this past month. Charity never faileth. I have love for those strangers who smiled at Cicily or gave her extra attention. And for all who have read this blog over the years for allowing me to share my Cicily with the world. It may be a small audience, but it truly has covered the world. And that makes my heart happy to know that Cicily's influence and love have been felt and shared and made the world a little brighter. Cicily has degenerative hypomyelination (leukodystrophy) - no white matter coating her brain, which is terminal. For Cicily, this means she has limited motor control and "shakey" movements. It does not affect Cicily's cognitive abilities, as she communicates and learns at a standard level for her age. Cicily also has Treacher Collins Syndrome. For Cicily this basically means she was born with a cleft palate, small lower jaw, small ears, and no ear canals. Cis is such a tough girl though, and she's so easy going. She handles all of her difficulties so well. She's certainly up for her challenges! She continues to be a medical mystery and a joyful girl.